Lately number 72 has come out very often in the different courses in Taiwan and Malaysia, triggering an inner self-questioning about its meaning and the message that it carries. Not many people know that 72 is a very important number in the whole of existence for various reasons. The first and main one is because it refers to the 72 names of God, the Angel names, and it can also be found in the Jewish name of God – YHWH. The 72 Divine names come from the addition of the letters of the Holy Tetragrammaton, as each of them can be envisioned as four curtains hiding the four worlds of the Kabbalah. Accordingly to the tradition, the Kabbalah or Tree of Life was a map given to man by God to assist him in his return journey to a state of Oneness with the all of creation: a map of consciousness describing the inner transformation/transmutation of consciousness that each of us has to experience in order to move from personality to soul, and from soul to the unity with Spirit. The Tetragrammaton can be divided into the constitutive knots of its four letters, obtaining twenty-four spheres expressing the trinity. Each of them has a trinity value, reflecting the energy of the spheres of the Supernal Triangle of the Tree of Life, which underlies the all of creation – Kether the Crown, Chokmah Wisdom, Binah Understanding. The Tetragrammaton, when it reveals itself to us, is written in us by the 72 names, derived by the 24 trinity knots. 72 is also 12 x 6, where 12 is the number related to the twelve tribes of Israel and 6 is the number associated to the Seal of King Solomon. 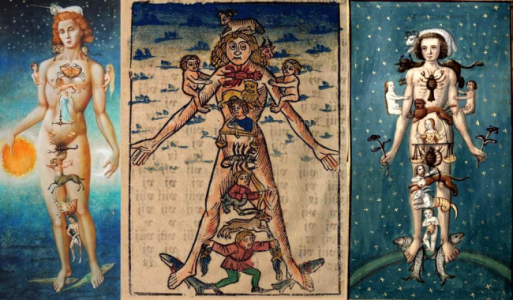 Twelve are also the zodiac signs, a depict of the complexity of the universe, while six can be related to the sixth day of creation, expressing the separation between God and humanity, as creation was completed on the seventh day. If we look at 72 from the numerological point of view, 2 is the number of the Ray of Love and Wisdom, and 7 the Ray of Magic and Ceremonial Order. It means becoming a vehicle for the expression of the divine love. Magic is something we can achieve when we are in complete alignment with creation, with the Divine plan. The more the little self becomes invisible, the more we can become a reflection, a mirror of that plan. 7 represents fusion, fusing above and below, Heaven and Earth, in us. When there is a fusion the two ingredients disappear, they become one in the solution that we obtain – this is why we need to become invisible. Ray 2 is Love, and Love is the only energy that can trigger the alchemical process. Love means acceptance of the process, acceptance of the sensibility that may result from it. In the Aura-Soma colour-care system® the Equilibrium bottle number 72, blue/orange, is called Clown/Pagliacci. The clown of the theatre is a very ancient art, not easy to perform. Part of the training includes a very deep inner work because the performer is asked to drop all the masks and simply BE, the beingness being the achievement, where the clown, without doing anything, without actively act, returns to an inner state of calmness, from which the performance naturally arises. The actor is asked to lose himself into the eyes of the public and, as he does so, heaven and earth reunite. Suddenly he finds himself in the vastness of the ocean and he floats in it, following its flow. Who is creatIng the improvisation, who is conducting the performance? The osmosis between the plateau and the clown occurs and the fourth wall falls down. When the gestures of the clown become free from fear and anxieties, each movement is guided by an inner state of playfulness, triggering a smile on the face of those who are watching – both laughing and making people laugh come from a state of inner freedom, a childlike state, which means to return to and to re-discover the lightness of being. The clown is the anti-hero who plays with the challenges of existence, with our fragility and the human weaknesses, like in the Italian opera Pagliacci (which means clowns) by Ruggero Leoncavallo, still widely staged all over the world. Pagliacci was premiered at the Teatro Dal Verme in Milan on 21 May 1892, conducted by Arturo Toscanini; at the Royal Opera House, Covent Garden in London on 19 May 1893; and, a month later, at Grand Opera House in New York. The opera depicts the story of Canio, who arrives with his theatre company in a little village in the south of Italy to perform a comedy. Canio cannot imagine that his wife Nedda betrays him with Silvio, a local farmer. Tonio, who loves Nedda, but his love is not returned, informs Canio about the betrayal of his wife. Canio discovers the two lovers while they are promising each other eternal love, but he does not manage to see Silvio’s face who escapes in order not to be caught. in the middle of this situation Canio does not have the time to react because a member of the theatre company comes to fetch him because the comedy is about to start and the public is waiting. So Canio has to wear the clothes and put the make up on in order to play the role of a Pagliaccio (clown) who is betrayed by his spouse Colombina, interpreted by his wife Nedda. Reality and fiction become one and during the comedy Canio kills both the wife and her lover, who had come to help her. Only too late the public realises that what has just happened is not fiction but reality. There is always a sad clown in us, if we get trapped in the emotions that come from the conditioned patterns of the genetic lineage that we carry (the orange is the DNA/RNA, the restoring of the timeline). The power of the emotions is such that they can change our DNA. In each of us there is a great possibility of peace, the blue, the possibility to detach from the emotional identities which play many roles on the stage of ourselves. If we focus our attention, our concentration on the detachment – the red within the orange – we can find peace of mind and a sense of allowance of what is. The Aura-Soma Equilibrium bottle 72 contains within itself bottle 20, the Star Child, blue/pink. Each of us is a child coming from the stars, each of us is here to fulfil our mission and purpose. The different parts that we play on the stage of ourselves are just parts, the greatest guide, the soul, is within, just waiting to be recognised. The affirmation of the Aura-Soma Equilibrium bottle number 72 is: I honour the child within me and know this child can enter the kingdom of Heaven. Our unique aim is to awaken the Divine within and manifest it through us.